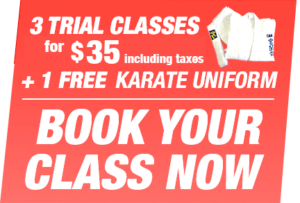 Our karate school welcomes students of all ages and abilities. We teach karate in a friendly atmosphere where respect, perseverance and mutual help are valued. We follow the teachings of grand masters Mas Oyama, Shigeru Oyama and Manny Matias. These teachings are at the core of the World Kanreikai Karate Organization. Shihan Denis Cordeiro has been at the helm of our school since its beginnings in 1998. Along with his instructors, he is working incessantly to promote karate as a first rate fitness activity, a powerful tool for personal growth and an exciting competition sport. We welcome you and invite you to learn more about us – our code of conduct, the Japanese temonology we used at the dojo, our gradation system (tips and belts). Find out more about our Chief Instructor, our Instructors, our Black Belts and discover our freshly renovated dojo. WELCOME! We are pleased to greet you at Montreal Kanreikai Karate. We invite you to learn more about our karate school, teaching approach in accordance with the Japanese tradition, team of instructors and gradation system (tip and belt levels). Our dojo has been completely renovated! We are proud to welcome you and to offer you a quality teaching at our refurbished karate school. We will do our best to serve you in a safe and friendly atmosphere. Shihan Denis Cordeiro, 5th dan, is a well known figure in the karate school community. His qualities as a teacher, trainer and promoter of karate make him a very appreciated and respected leader among his peers. All the instructors who assist Shihan Denis have learned and practiced karate under his direction at his school. They have known and respected each other for years. With Sensei Denis, they make a solid team where each one brings a unique contribution according to his or her specific skills. The learning level of each student is illustrated by the color of his belt. Our gradation system establishes the technical requirements for every belt (or tip) level. This system, which is in effect at all World Kanreikai Karate schools, adds rigour and objectivity in our students’ promotion process.